Panzanella or panmolle is a Tuscan chopped salad of bread, tomatoes, vegetables and anchovies which is popular during summer. The bread is dressed with olive oil and vinegar. The name is believed to be a portmanteau of “pane”, Italian for bread, and “zanella”, a deep plate in which it’s served. You don’t see salads very often on my blog but I can assure you that we eat salads every day and I have a lot of salad recipes which I have not posted. I promise that I will make a post soon where I will post all the salads I have made and have not posted. I love beets and after I roasted them and preserved them in vinegar, I was google searching for something new to make and I found this lovely winter recipe by Tyler Florence on the Food Network. 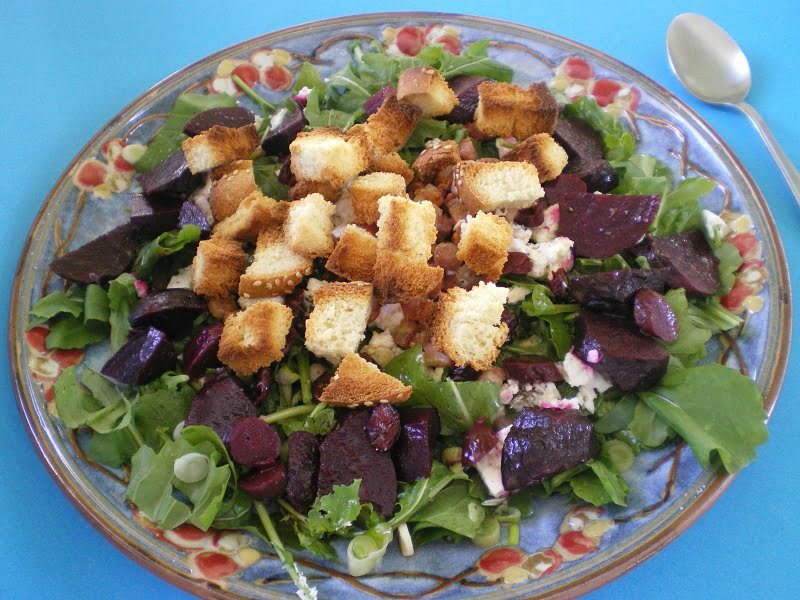 The changes I made to the recipe was that I used only red beets, I used the ingredients I had at home which was of course Greek feta instead of goat cheese, Greek bread instead of Italian and of course Greek olive oil and Greek honey. Instead of dates, which I did not have, I added craisins and I also added a gherkin in the salad and a clove of garlic in the salad dressing. I also added some of the Greek fresh herbs from my pots, rosemary, oregano and thyme in the salad and it was delicious. In a non-stick frying pan sauté pancetta until crisp. Discard all the fat and place pancetta on a kitchen towel to absorb all the fat. Cut the bread into small pieces and roast in the oven until golden brown. Wash and cut the rocket and spring onions and arrange in a big platter. Add fresh oregano, rosemary and thyme, salt and pepper and mix. Add pancetta and crumbled feta on top. Arrange beets, gherkins and craisins on top of the greens. Meantime prepare the salad dressing. In a food processor add the olive oil, the honey, lemon juice, orange juice, balsamic vinegar, garlic, salt, pepper, and mix together. Add the salad dressing and mix all the ingredients. Finally add the croutons last, so that they do not soak. Sprinkle some freshly ground pepper on top. Note: If you are roasting beets from scratch the time depends on the method used and it ranges from 20 minutes to 1 hour or more, depending on the size of the beets. Panzanella or panmolle is a Tuscan chopped salad of bread and tomatoes that is popular in the summer. It includes chunks of soaked stale bread and tomatoes, sometimes also onions and basil, dressed with olive oil and vinegar. I am submitting this recipe to Yasmeen, of Health Nut, who is hosting this week’s Weekend Herb Blogging #175, created by Kalyn’s Kitchen and continued by Haalo, of Cook (Almost) Anything at least Once. I shall also be hosting Weekend Herb Blogging #177 in less than two weeks. I have just received an e-mail from WWF Greece that Greece is now ranking first in participations worldwide, followed by Canada and Australia is now ranking third. Wow.. really Delicious & healthy dear..
Good idea to add beets to a panzanella salad. I would definitely try it. I grew up on pickled beets so would love this salad. Ivy, nice play on the salad’s name…Pantzaria and panzanella go together rather well! That is a beutiful salad, Ivy! I love panzanella (who doesn’t love crispy bread cubes?!) and beets, too. It is much the same for me, Ivy, I eat a lot of salads but hardly ever post them on my blog. This is a lovely salad- delicious beets, and I love the little zip of orange juice in the dressing. Ivy, that looks like an amazing salad. I adore beets and this sounds so filling and delicious with all its components. Some of my favorite flavours are in this bright and colourful salad! I do find beets go especially well with feta! I really love roasted beets! this looks fabulous! What a beautiful recipe. I love roasted beets as well. The only thing I would change in the entire recipe would be to flip spinach for the arugala. I never seemed to warm up to bitter greens but can totally see the exchange wouldn’t hurt the dish. Lovely salad recipe..Long since I dropped by ur blog.Wonderful recipes.